I'm pretty proud of that blog title. One could even say it's aMAZing. So far this has been a very busy fall! 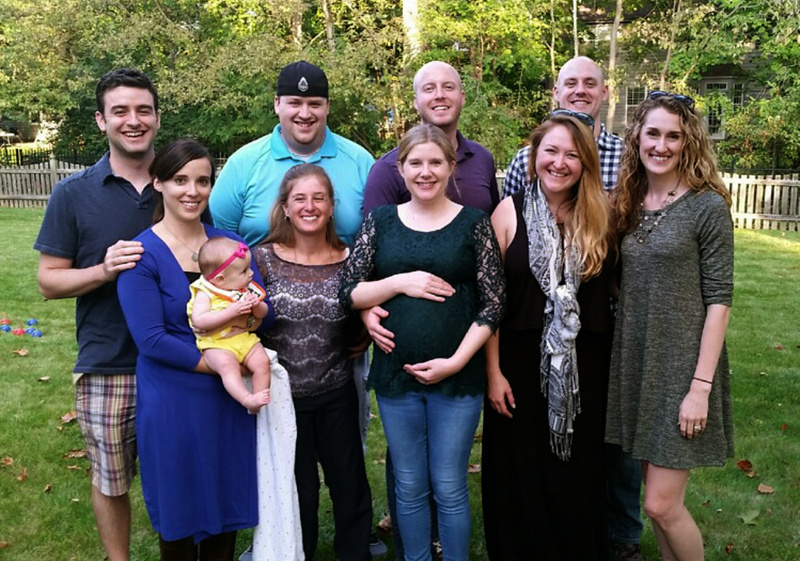 Two weeks ago, we visited my family and attended a baby shower for my friends Courtney and Luke who are expecting a little boy in December. I realized earlier in the week that I didn't have a handmade gift for them... and that just wouldn't do! Tuesday evening I picked out a pattern (Elwood Cardigan), and Wednesday morning I popped into my local yarn shop for some Rowan pure wool superwash. It was a bit itchy, but softened nicely after washing. I finished the yoke Wednesday, the body and one sleeve Thursday, and the second sleeve and shawl collar Friday. I washed it Friday evening and sewed the buttons on Saturday. I omitted the stripes from the pattern (no time for stripes!) and only added 3 buttons (because I liked it better that way, not because I didn't have time for a 4th button). I love how it turned out... and I'm pretty proud of finishing a whole sweater in just three days! Details on my Ravelry page. Dan, Mae, and I had lots of fun at the shower. One of the activities was making an alphabet book for the baby. Dan drew a Pumpkin for P, I drew a Koala, and Mae drew a Zig Zag (actually I was her pinch-illustrator). We enjoyed beautiful fall weather and visited with my high school friends who I haven't gotten to see in a while! 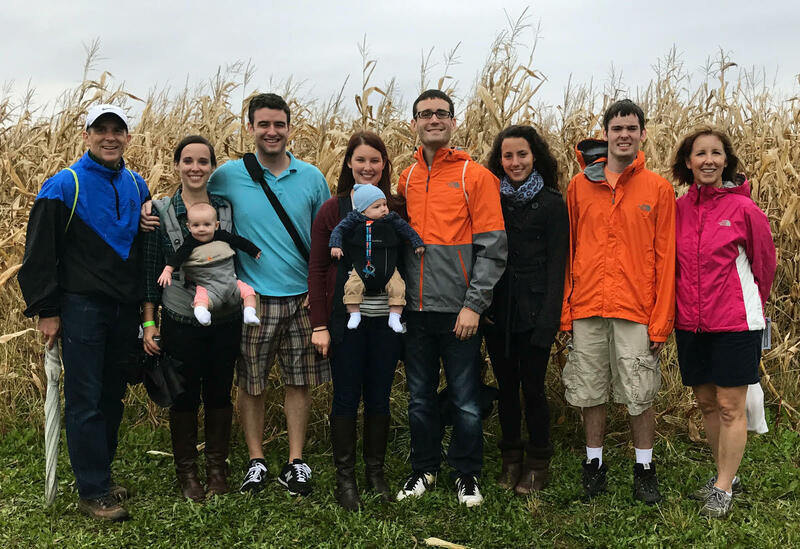 Sunday's weather turned out much drearier than expected but we still managed to make our annual trip to the corn maze! I led us through the Everest-themed maze as we collected all the clues (and as our shoes collected all the mud). Mae and Oliver enjoyed their first maze adventure, though they both fell asleep just a short way in! Last weekend, Dan's mom came to visit for some quality time with Mae. Mae was so playful and cute all weekend and even drifted off to sleep while playing on GranE's lap, which was adorable. On Saturday we went to the zoo for a couple hours and then met up with Courtney, Luke, and Zach who were in town for the day. Sunday we relaxed at home and went for a walk to look at some of the pretty homes nearby. GranE said her plan was to lay on the floor and play with Mae, and we certainly did lots of that this weekend... I call it a success!